Apart from forcing us to wrap up in scarves and coats when we leave the house, cold weather when the temperatures regularly dip below freezing can play havoc with cars. Tyres and suspension systems are put under increased strain due to having to deal with snow and ice and the engine has to work harder to achieve optimal performance in difficult road surface conditions. The cooling system, however, is the part most significantly affected by cold weather. 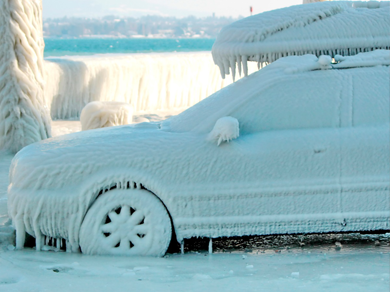 As it has a lot of coolant circulating through it, freezing temperatures can have the obvious effect, partially or completely freezing it (it is important to remember that coolant is not the same as antifreeze, which works to lower the freezing point of the circulating liquid). This can affect the radiator and cooling system, which have to expand to accommodate the frozen liquid. In turn, cracks may form because of the additional stress the system is under, and result in a leaking cooling system that could eventually cause the car to completely break down. Additionally, any leak sprung in the radiator could mean that transmission fluid and coolant become mixed – while the former won’t harm the cooling system, the latter can harm the transmission. If this occurs, the transmission and radiator might have to be completely replaced. You may also want to change your oil consistency to ensure maximum engine effectiveness – thinner oil viscosity is more suited to cold temperatures. If you are caught unawares, you may have to flush the system and refill it with the proper levels of oil and coolant, mixing in K-Seal sealant solution (it doesn’t matter whether the engine is hot or cold when it is added) to fill the cracks that might have formed already.